In my last post, Arthur B. Armstrong: The California Armstrongs, I wrote about Arthur Armstrong leaving all his Maine Armstrong roots and uprooting his family to remove to California. I am sure he made the move because he thought it would lead to a better future for himself and his family. He was right. I think we can be fairly certain that his families life took a better financial path due to the move to California, but maybe not for the reasons he could have anticipated. Arthur B. Armstrong's profession while living in Maine was to work as a Sparmaker which is a type of ship's carpenter. When he moved to Oakland, CA he worked at first as a carpenter and then returned to his profession as a sparmaker. One can't expect a big improvement in your fortune by doing the same exact thing on a different coast. However, the family fortune took a decided turn for the better and it came through the marriage of their daughter, Lulie W. Armstrong. Lulie was just a teenager when they completed their move to Oakland, California. She graduated from Oakland High School in 1878. On January 11, 1881, she married Abel Willard (A.W.) Porter. A.W. Porter was born November 14, 1858 in Shirley, Massachusetts. You have to wonder how they met and if their shared experience and possibly New England accents might have made them feel at home with each other. At 22, he was a partner/owner of Porter Brothers, a prominent fresh produce dealer. Porter Brothers was formed about 1879 and only been open a few years, but was already a growing and successful business. Over the 52 years that A.W. Porter and Lulie were married, they lived well. They had at least one live in servant and took frequent trips abroad including multiple trips to Europe and Hawaii. I can see from old passports that they traveled for months in Europe including: England, France, Germany, Austria and Russia. A.W. Porter and Lulie lived most of their married life at 1816 San Jose Avenue, Alameda, California. Which is located about a 1/2 mile from San Francisco Bay. Their house is still there. It was originally built in 1906. Today it is a a multi-family home (three units), but the outside is probably very similar to how it might have looked when the Porter family lived there. Lulie Armstrong's cousins in New England were leading much harder lives. Most worked as laborers and in and around the port of Portland, Maine. It was obvious that Lulie benefited in a much improved lifestyle by her marriage to A.W. Porter. And it benefited the entire family. Toward the end of Arthur B Armstrong's career he worked for Porter Brothers. Which I am sure gave him a better more secure living than working as a ships sparmaker. When Arthur passed away, Ellen Armstrong lived with he daughter and son-in-law at 1816 San Jose Avenue. 1893, Arthur Jr. was working as an agent for the Porter Brothers in Los Angeles. After Ulmer had worked at Porter Brothers and learned the business he worked in sales at California Fruit Co. In 1900, Arthur Jr started his own fruit company called Armstrong Fruit. He and Ulmer worked in the fruit and agriculture business for substantial parts of their careers. You could make a case that Lulie's marriage to A.W. Porter opened many doors for her brothers and exposed them businesses that would help lead them to a lot more success than they could have reasonably expected back in Maine. 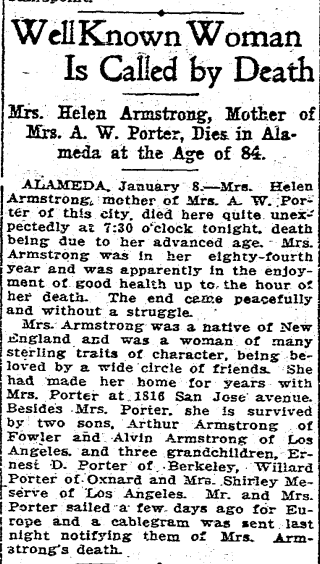 Here is Ellen L. Simonton Armstrong's Obituary as it appeared on January 9, 1913 in the San Francisco Chronicle. I think it is funny that that the head line is "Well Known Woman is Called by Death". How well known was she when they got her name wrong in the obituary? They call her Helen, when her name was Ellen. 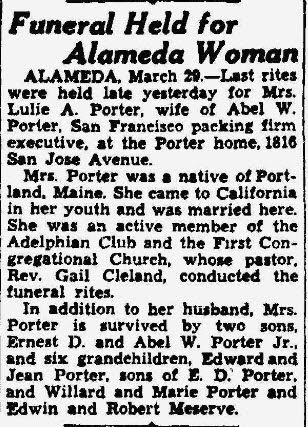 Here is Lulie Armstrong Porter's services notice from Mar 29, 1933 as it appeared on the San Francisco Chronicle. 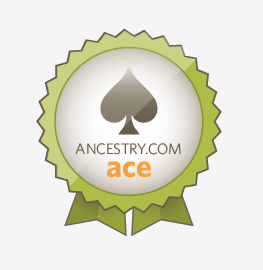 My 2nd great grand uncle, Arthur B. Armstrong was born in Cape Elizabeth, Maine on May 8, 1827. He was the son of John Armstrong and Betsey Woodbury Armstrong. Arthur B. Armstrong was one of 6 children his siblings: Ebenezer, Lucy, John, Israel, & George. At the age of 26. Arthur married Ellen L. Simonton. They were married on Sept 15, 1853 in Portland, Maine. Arthur's profession in Cape Elizabeth was as a Sparmaker. Sparmakers work on the wooden ships as carpenters. Usually the job is associated with building and repairing ship masts which are also knows as spars. Cape Elizabeth is right on the coast of Maine and close to Portland which was a busy seaport. The civil war brought a dramatic reduction to the numbers of ships being built in Maine and decreased the commercial shipping. Scratching out a living in Maine was never easy, but had become even more difficult during this time. We may never know the reason, but Arthur B. Armstrong decided to uproot his family and move to California. One has to think that some specific story or idea of a job opportunity must have spurred him to action. We do know that the San Francisco area was growing rapidly. By 1870, San Francisco had become the 10th largest city in America. He must have believed that California was the place he oughta be, so he loaded up the family and moved to Oakland. Hmm....that sounded better in my head than when I write it. Just assume it is a joke relating to the Beverly Hillbillies TV show. Between 1873 and 1876, Arthur and family removed from Maine and arrived in Oakland, California. In 1876, Arthur B. Armstrong is listed as a Carpenter for C.P.R.R Co. in the Oakland City (California) directory. I haven't found much about his life living in Oakland, California. We can expect that his life and that of his family was much improved over what it might have been for if he had stayed in Maine. 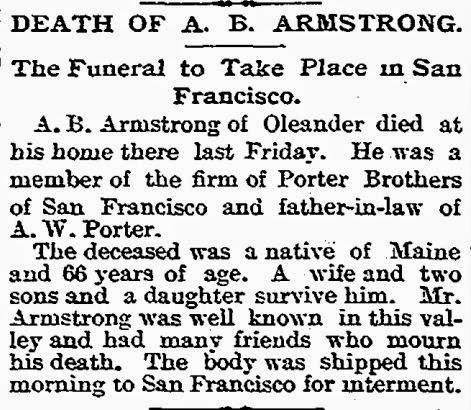 Arthur B. Armstrong died at the age of 66 on Nov 10, 1893. Arthur's parents and siblings lived and died in Maine and New England. I can not find any evidence that Arthur ever returned to visit his family living in Maine of they visited California. In a very real way, he branched off from his Maine roots and didn't look back.